We offer many different types of packaging designed to fit each patient's specific needs. These range from traditional pill bottles to daily time-dosed packaging. The information below will give you an overview of the packaging options that we offer at the Medicine Shoppe. If you have any questions, call one of our professional pharmacists to learn more. Pill bottles are the traditional pharmacy packaging. 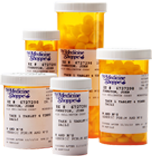 Medications are packaged in appropriately-sized bottles for the entire supply of a given prescription from a physician. 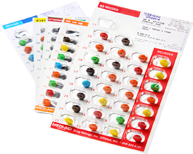 Blister cards are commonly used as unit-dose packaging for pharmaceutical tablets, capsules or lozenges. They can provide barrier protection for shelf life requirements, as well as a degree of tamper resistance. Blister cards that feature multiple spaces for medications are sometimes called blister packs or blister strips. 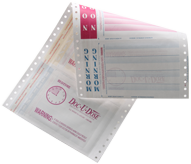 In the United States, blister cards are mainly used for packaging drug products, or for Over the Counter (OTC) medications in the pharmacy. One of the main advantages that unit-dose blister packs hold over other methods of pharmaceutical packaging is the assurance of product/packaging integrity (including shelf life) of each individual dose. They also provide the ability to create a compliance pack or calendar pack by printing the days of the week above each dose. Another benefit of blister packs is that they hinder the use of OTC medications in the manufacture of illegal drugs. Doc-U-Dose is a system designed to increase medication compliance for patients who are taking multiple medications. This system provides a critical link between the patient and the health care provider. It virtually eliminates medication errors and the confusion, fear, and risk associated with taking multiple medications. Doc-U-Dose also allows patients to independently take medications, promoting an increased sense of dignity and independence. Doc-U-Dose is an economical system designed for patients taking multiple medications who are not in an institutionalized care setting. PACMED is an automated, multi-dose packaging system for oral solids that features easy-opening envelopes. PACMED packages list the patient’s name, drug description and type, as well as the brand equivalent if the medication is generic. The PACMED high-speed packager automates bar-code packaging of medications and improves packaging accuracy. It also facilitates the transition to scanning bar-coded medications at the patient’s bedside. In addition, the PACMED packager automatically tracks medications by lot number and expiration date. This assists the pharmacy in removing expired medications from circulation and ensuring that medications are refilled in advance to keep patients compliant with taking their medications. 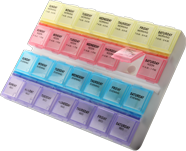 The Pill Box is comprised of 7 day planners in an organizer tray. The multicolored pocket on this medicine planner makes it very easy to open and keep track of medication. Large letters and Braille are used for the sight impaired. Compartments are labeled by day of the week and times of the day such as morning, noon, evening and bedtime.